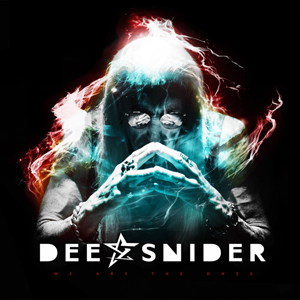 Iconic frontman Dee Snider (TWISTED SISTER) has announced that his new solo album, entitled We Are The Ones, eill be released on October 28th on Red River Records (distributed by BFD/RED). Not wanting to waste any time in getting his legions of fans excited about We Are The Ones, Dee has launched a PledgeMusic campaign that offers a wide selection of exclusive items, as well as a discounted digital download of the full album upon the release date, including signed drumheads, lyric sheets, guitars, guitar pedals, a signed microphone, and even signed and numbered Dee Snider Legos. Also, a very special dinner with Snider and producer Damon Ranger that includes an early listen of the new album, and having Snider record a fan’s choice of an outgoing voicemail message, “Happy Birthday” or other personalized message as a MP4 digital file. The grand incentive is a full band private performance anywhere in the US. All pre-orders come with the AccessPass, which will give fans exclusive artist updates and a behind-the scenes look at the making of the record. To pre-order the record, check out the PledgeMusic campaign right HERE. Produced by Grammy, Emmy and Oscar winning songwriter, Damon Ranger, We Are The Ones crackles with modern energy, from the call-to-arms manifesto of “Rule The World”, to the anthemic bonding of “So What” (complete with, yes, a string section) to the intensely synth driven “Close To You”, to the thematically soaring “Superhero” (a song tailor-made for running over the end credits of the next Marvel or DC movie blockbuster if ever there was one). Another significant highlight of the album is a newly re-recorded acoustic version of “We’re Not Gonna Take It” which has also been tapped the official anthem for The Recording Academy’s advocacy efforts, including the Fair Play Fair Pay act. Dee is currently working on a fall tour, which will be announced in the coming weeks. Stay tuned for updates.